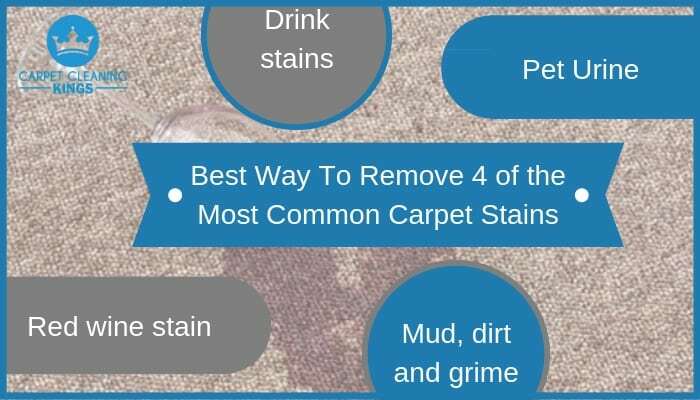 There’s no getting away from the fact that a stained carpet is an eye sore and acts as a constant reminder every time you sit down on the sofa or walk into the room. Whether it’s muddy shoes, a glass of red wine that’s gone awry, or an over excited pet, it’s there for all the world to see. The good news is that it is possible to remove those stains as long as you know what you’re doing. By far the hardest part of getting rid of pet urine is eradicating the odour. Firstly make up a vinegar/water solution to break down the bacteria which creates the smell. Secondly when nearly dry, liberally sprinkle baking powder over the area and leave for around 10-15 minutes, Finally give it a good vacuum. If the stain or odour doesn’t lift the first time, then repeat the process. When we spill fizzy pop it really needs super quick action before it penetrates into the fibres of the carpet. Doing so will stop the sticky area from attracting dust particles leaving a dark or grey ring. Therefore absorb the spill quickly using a large clean cloth or towel. Then scrub the area with a light soapy solution. Finally rinse the soap out and dry thoroughly. Mud and dirt are probably some of the most common stains found in our carpets. The good news is that they’re usually the most easiest to remove too. One thing you do need to remember is to make sure that the mud is thoroughly dry before you try to get rid of it. Use a vacuum cleaner to pick up the excess dirt and then scrub the area with a damp cloth. When dry vacuum again. 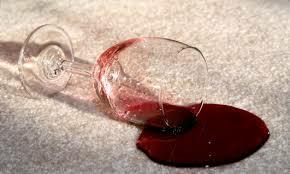 Besides being dark in colour red wine is very acidic and can cause problems to the fibres of your carpet if allowed to penetrate. Again like fizzy drink spills it’s always best to act quickly. This doesn’t mean following it with a glass of white wine as this is an old wives tale that doesn’t really work on carpet. Instead use a large cloth or towel to blot the area taking care not to scrub. Then once as much of the liquid has been removed as possible, pour cold water over the area to dilute it further. The next step is to dry the area using a clean towel and then mix up a baking powder water solution to form a paste. Spread it over the stained area and allow it to dry. Finally vacuum the area to achieve the desired effect. Carpet stain removal can be frustrating and to be honest…hard work. Why not take the stress out of the job in hand by calling in the professionals? At Carpet Cleaning Kings we use the very latest hot water extraction methods to ensure that all stains are removed, whatever they are. This leaves your carpet looking, and smelling and feeling deep-down fresh. Why not contact us on 1300 7000 75 and put us to the test. You’ll be glad that you did.